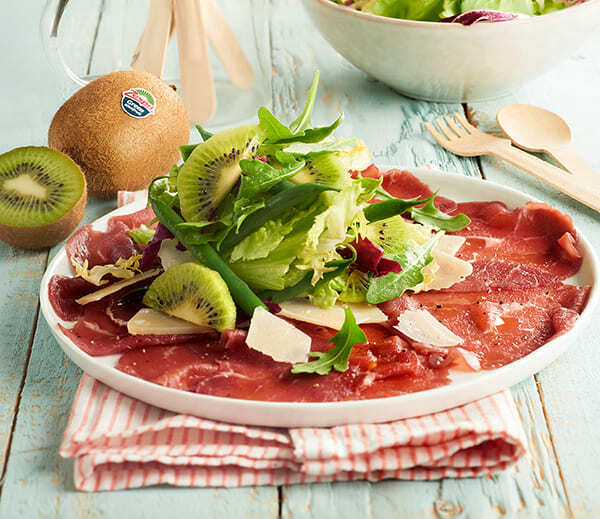 Try this classic Italian Carpaccio full of flavour and rich in protein and fibre. Traditionally served as a starter or as a main course if you increase the portion size. A fibre-rich recipe with a high vitamin C content. A good source of potassium and a natural source of folate. Place the beef fillet in the freezer for 30 minutes so that it firms up and then, using a sharp, broad-bladed knife, slice as thinly as possible. Steam the beans for 4-5 minutes, drain and refresh in iced water. Wash the lettuce and dry well. Peel the Zespri kiwifruit and slice into semi-circles. Divide the slices between 4 plates, arranging in a circle and placing the lettuce, beans and kiwifruit in the centre. Dress with salt, pepper and a few drops of lemon juice and oil. Scatter over some parmesan shavings and serve straight away. We all know that we feel better when our insides are happy. Days are lighter, moods are brighter – good digestion puts a spring in our step!